This post was graciously sponsored by BIRCH LANE. Bonjour and welcome to our al fesco dining tour! Karianne of THISTLEWOOD FARMS started the tour on Monday with her post. Now I want some of that sweet corn she was serving. Oh well, I don’t have corn on my porch, but I do have some drinks and a cheese tray. Come on over and let’s enjoy a little time outside dining al fresco. I’ve said it before, but this is my very favorite place in the whole world. This is where I love to entertain my friends and family. When I was younger I loved traveling especially to France. I soaked up the culture, the joie de vivre and the lovely people. As I have gotten older, I realized I don’t have to travel to get a slice of France. I can do it at my own home, n’est-ce pas? For starters, in Provence, I saw so many people dining outdoors. So we dine al fresco as much as we can. I set up plates, glasses and dishes on the porch so guests don’t have to go far to get a refill. I use an old ironing board to serve guests. 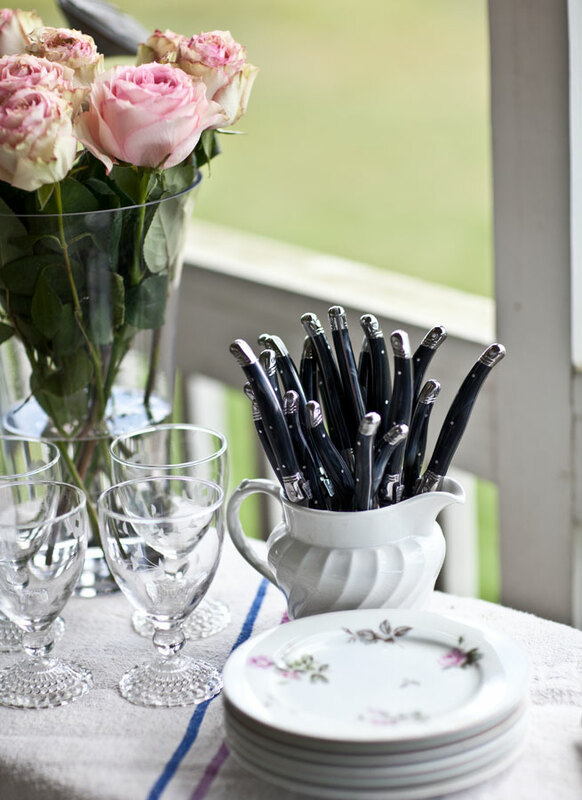 What flatware do I use? I use Laguiole flatware. It’s gorgeous, oh so French looking, and of course, made in France. I’ve gathered all of my flatware for the afternoon in a vintage ironstone creamer. This set is black with a marbleized finish, so pretty. Come on over and grab a chair. I saved you a rocker. The rockers will go with just about any decor, but I wanted you to see how beautifully they work with my antique French settee (formerly a crib.) Can you see the pasture and the woods beyond? The house sits up on the hill, so you have a nice view of the back 20. I’ve used a European wagon in French blue for my coffee table here. I set a cheese tray on the settee. I love tasting cheeses. I’ve got a smoked Gouda, a sharp Cheddar and a goat cheese on the tray. The faux olive trees may be my favorites. I just love them. They are not real, but they look just like the real thing. I have an olive tree in my backyard, and I love using cuttings from the tree, but they only last a few days before they turn brown. These faux trees have the details down with leaves that have a silver underside. Of course I had to add something fresh from the farm. These are bluebells I cut from the pasture in a vintage silver pitcher. The wonderful thing about rocking chairs is that you can move them around the porch to wherever you want them. Remember the daybed that was on my back porch? I moved it to the city, so it’s not on my porch any more. I put these rockers where the bed was. Here we have a great view. Can I get you another pillow? The nice thing about the olive trees and my flatware is that I can bring them back to the city pretty easily. The rockers are a bit bulky to transport. I wanted to show you how well the flatware and the olive trees work in the city. Evie and I took a trip to the local bakery around the corner. I wanted baguettes but they didn’t have. It’s a small bakery, so you have to choose from what they decided to bake that day. I choose a Rosemary and Garlic sourdough bread. They had just made fresh pesto, so we bought some of that as well. Oh my goodness the smoked Gouda was good, but that fresh pesto was spectacular. When we came inside, I set the faux olive trees on my dining room table and thought they looked so pretty I would have to show you that look as well. 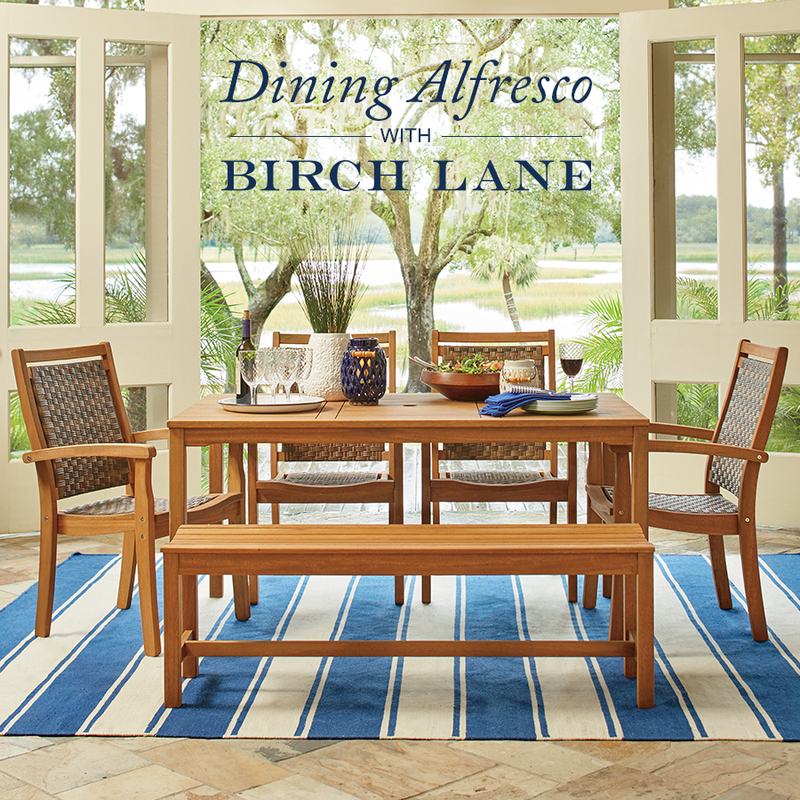 This post was brought to you by Birch Lane. Here is the shopping guide for the post. Be sure to check out tomorrow post over at STONE GABLE. Anita, your porch looks absolutely gorgeous!!! I love everything about it! I simply adore French Country Design. I loved the antique baby bed made into a bench. It looks like such a comfy space to sit and enjoy a sweet tea and just watch the world go by!!! It is very comfy Shannon. Thank you!!! Cheese and crusty bread, just perfect!! Thanks Gee. That was a labor of love. 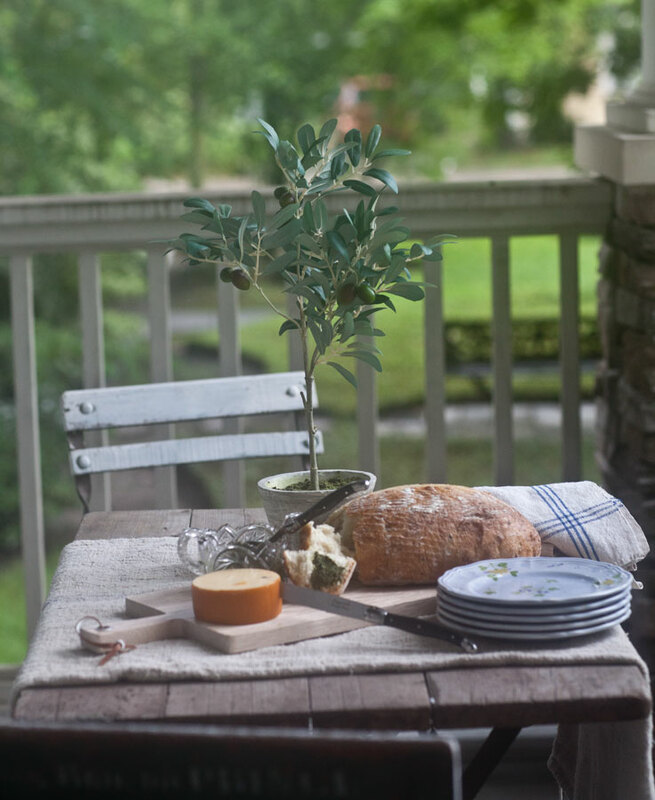 Dining on your porch must be sheer bliss!….love all of the beautiful details and love those faux olive trees! I wish you could come Shirley!! Oh, Anita! Such a gorgeous setting for your French al fresco dining! How very clever to use an ironing board as a sideboard. I love getting my French fix from you! So sweet Yvonne. I’m excited to see your al fresco dining post tomorrow!!! Best use of rocking chairs ever. 🙂 Your porch looks so pretty! Thank you KariAnne! 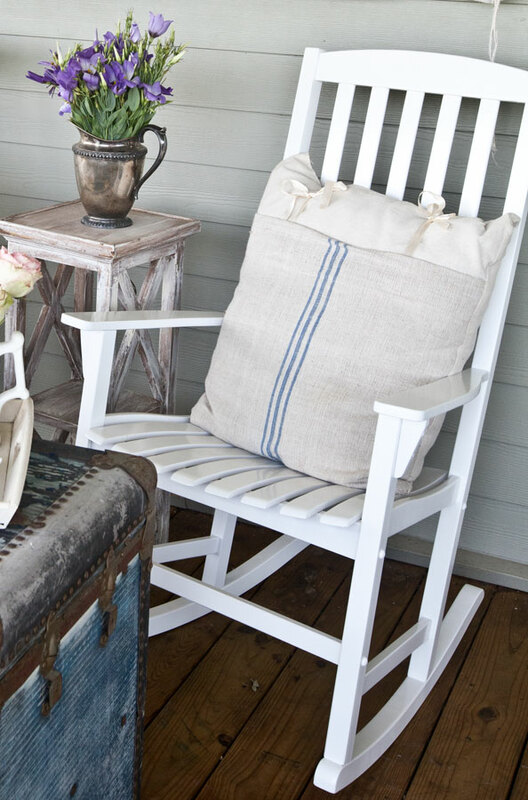 Everyone needs a rocking chair on the porch. I must have that ticking mattress! Where can I purchase? Lisa, I had it custom made. Where do you live? Lisa, I can probably have it done for you if you are interested. I would need to know the size you want, and I’ll see what I can get it made for and the shipping costs. 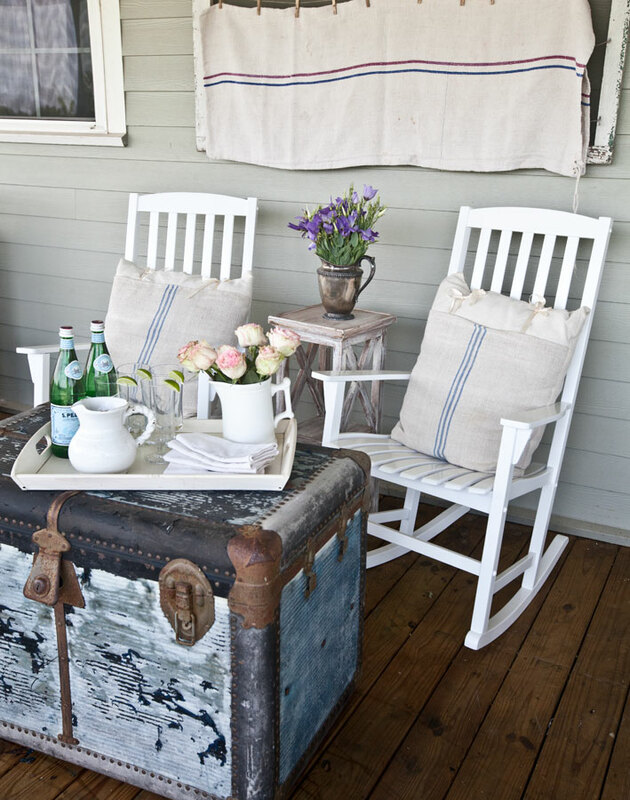 Your porch looks like such a nice place to sit back, relax, and have an iced tea! Thank you Linda!! You are so kind. Thank you for requesting my book be added to your library. That reminds me, I was going to donate it to a few of the libraries near me. I need to get that done. Anita, I started following your blog months ago. As a child we lived in Poitier, France, outside of Paris while my father served in the United States Army. Housing on base was full so we lived within the town of Poitier. This experience developed a love of French and Provençal decor within me. When I found your site I was thrilled. The content is fresh, appealing, and fun to follow. Keep up the good work. ? With a porch like that, I sure wish you were my next door neighbor. I would be stopping by much too often, I’m sure. What a pretty setting! Love the crib converstion! Charming! Thank you!!! You are so kind. Everything is gorgeous! Especially love the ironing board and daybed. Deb, it’s one of my favorite pieces. I love the French wagon on your porch . It’s lovely. Your style promotes the value of a healthy down time!! The simple beauty reflects a warm, genuine time with famy and friends. Love it!! Tres charming! Both the porch and the dining room. I was admiring your drapes. Did you make them? Love the trim detail. 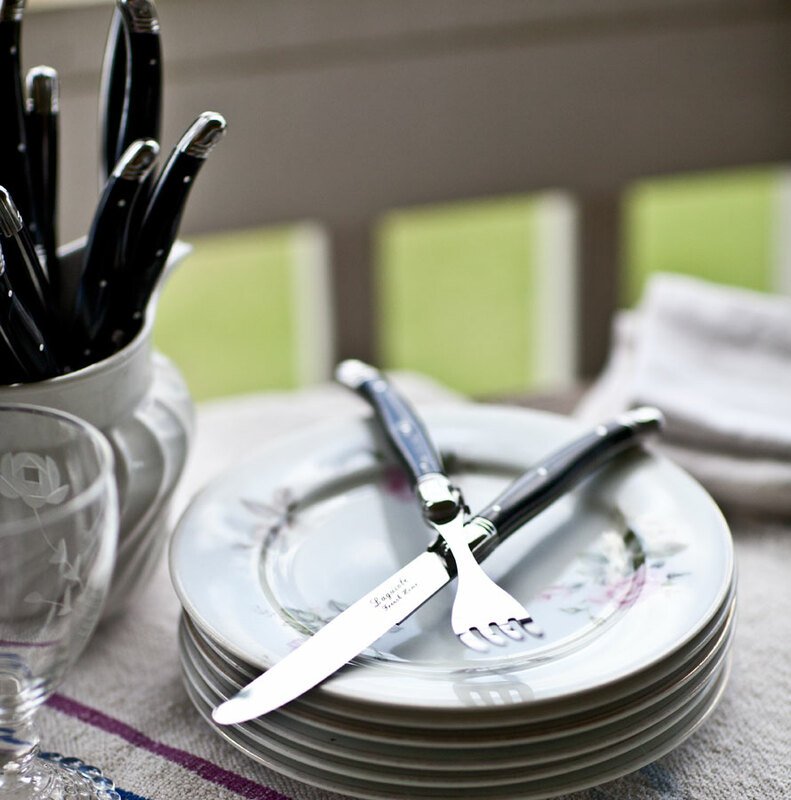 I also love dining alfresco and am now on the lookout for an antique ironing board to use as a buffet… how clever!! 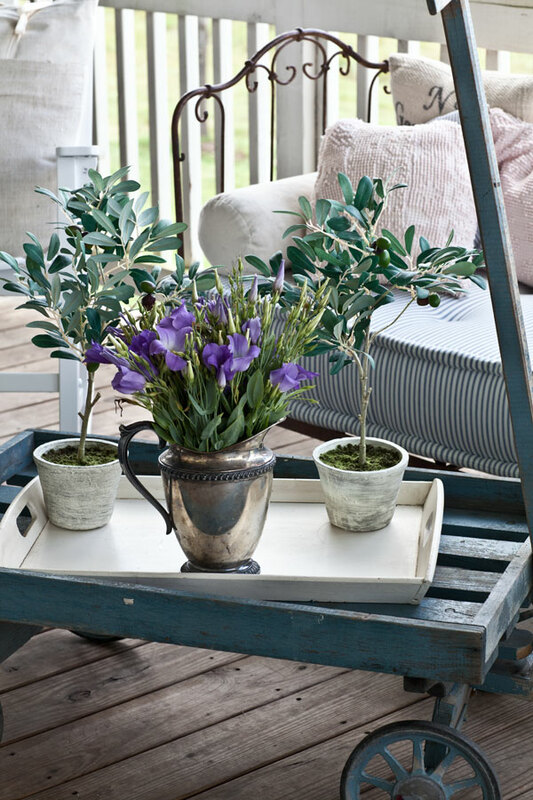 I also love the use of the blue wagon as a coffee table. It could be moved so easily. Thank you for not being too trendy and for staying with your style. You have great taste. I also enjoy reading about your family life. After all, the reason we want beautiful spaces is to share them with the people we love! I love your porch display!! The crib turned bench is gorgeous. I also love how you used the ironing board, and I love the coffee table. Such great ideas! I have a daybed on my back porch as well, and now I know that the old steamer trunk in the basement should join it. Thank you! Just love how you use different items in your decor, beautiful. I especially like the ironing board. 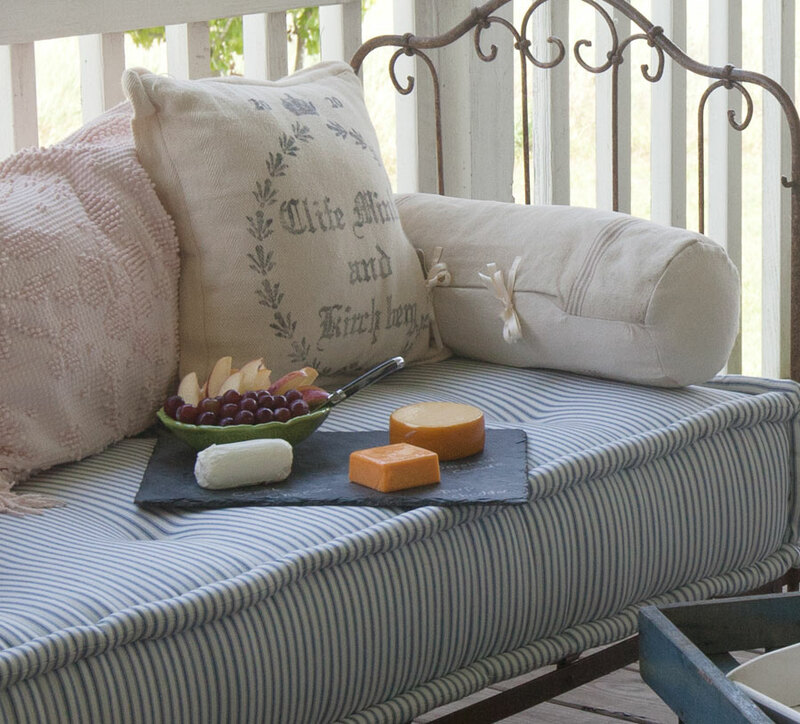 I absolutely love the bit of France’ on the porch! Makes my heart sing ? You have a beautiful hand at decorating. Absolutely gorgeous. Love the blue bells on the wagon. I almost feel embarrassed to say that this is the first time that I noticed roses displayed like you did in this blog. I always “fluff” mine out in the vase. I am so inspired that guess who is coming home with roses from the grocery store so that I can display them like yours! Sooooo European and lovely. 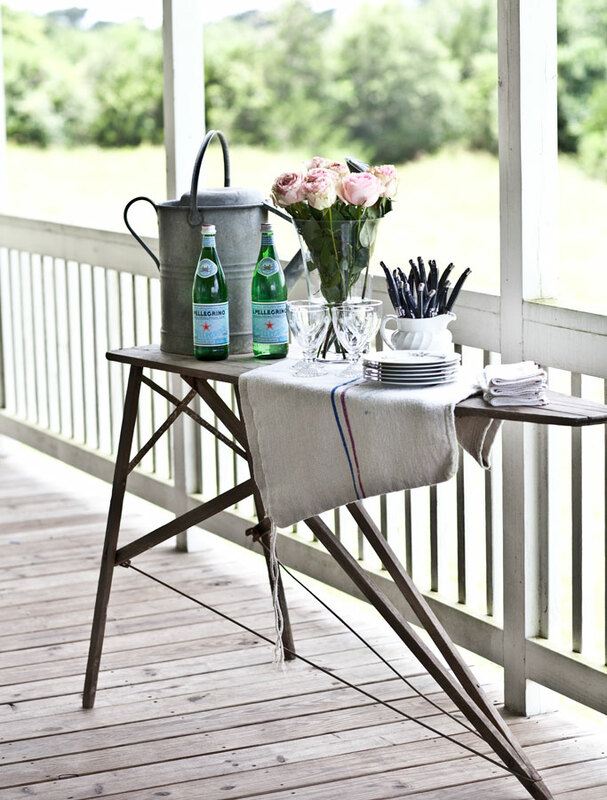 Love the ironing board as a serving table! I bought your book and love just looking at the pictures! It’s a lovely coffee table book as well! Of course BJ and thank you for thinking of me. It all looks so beautiful! I love the olive branches and trees as well, going to search for some faux for my home. And I love, love love all your pillows! I love your porch and enjoy the same things! This has given me some inspiration for my porch! Thank you! I adore your vignettes. You have wonderful taste and have one of my favorite blogs. I really like the faux olive trees from Birch Lane. I like how you showed them in various settings as well. I have to say your idea of using a beautiful antique ironing board was my favorite. Have a wonderful day. Your website has really helped me to bring French influence to my home. I have decorated with a theme in mind before. 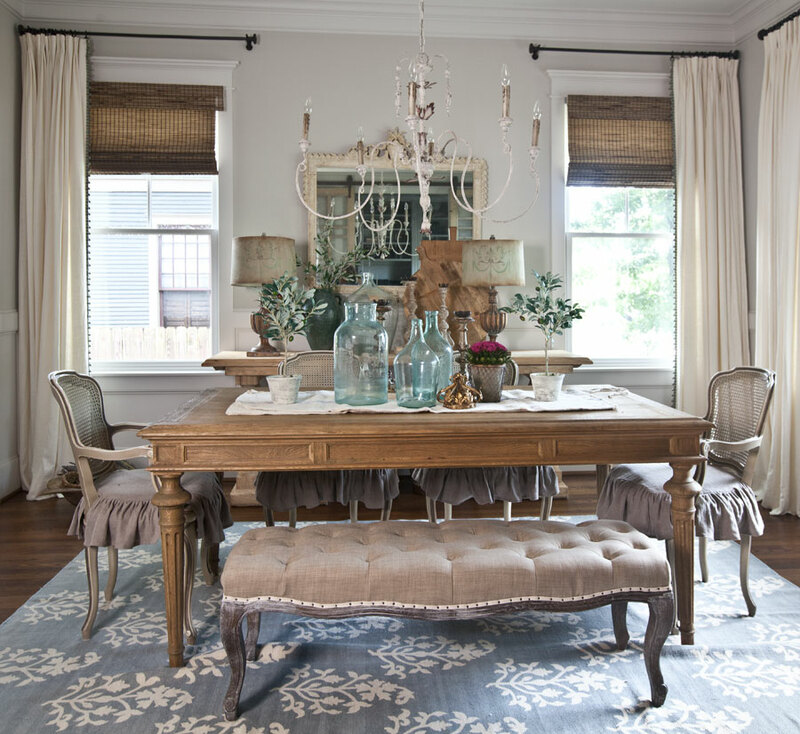 I love this comfortable and serene style! OMGOSH!!! I am just flipped out over your farmhouse. I’ve been following your blog for a month or two now and picked up on the Houston connection. Hmmmm…..Texas. I live in Pflugerville, just north of Austin. Then I found our your farmhouse is in Round Top. Antique Nirvana!!!! I’m head over heels in love with your decorating style. You are so blessed with a beautiful family and talent. I am in awe. I recently stopped in Giddings and shopped at 2 little antique shops there. Can’t wait for your next emails to come out. 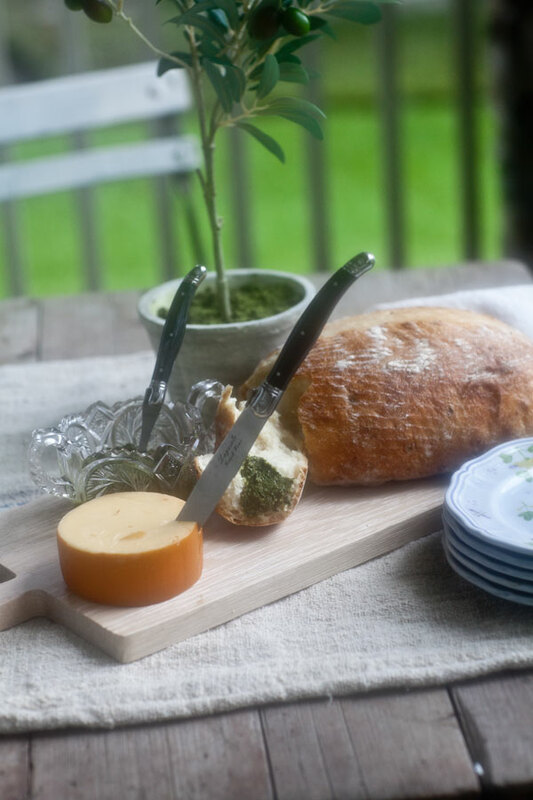 Your alfresco porch snack looks so delicious and sooooo French! 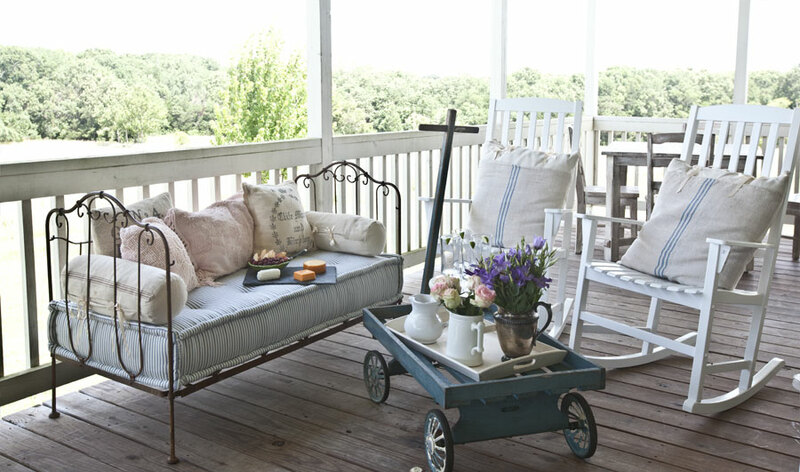 The converted child’s crib and blue wagon are perfect additions to your French-themed setting. I love to use olives in my home decor as well. I have a bunch of flaux long-stemmed olive branches in a basket on top of one of my amoires and a lovely iron-olives chandelier above my kitchen table. I also stenciled olive branches above the two arched doorways in my kitchen. I’m going to see if I can find one of those sweet flaux olive trees you show in your photos as I think one would look very nice on my kitchen island. I really like how you incorporate the darling little trees in different settings in your home. I love your blog, and I especially liked this one on your porch. It is very inviting, and comfortable looking. I really liked the use of the antique ironing board as a buffet, very ingenious. Good reuse of the ironing board, I mean there are limited uses for them. 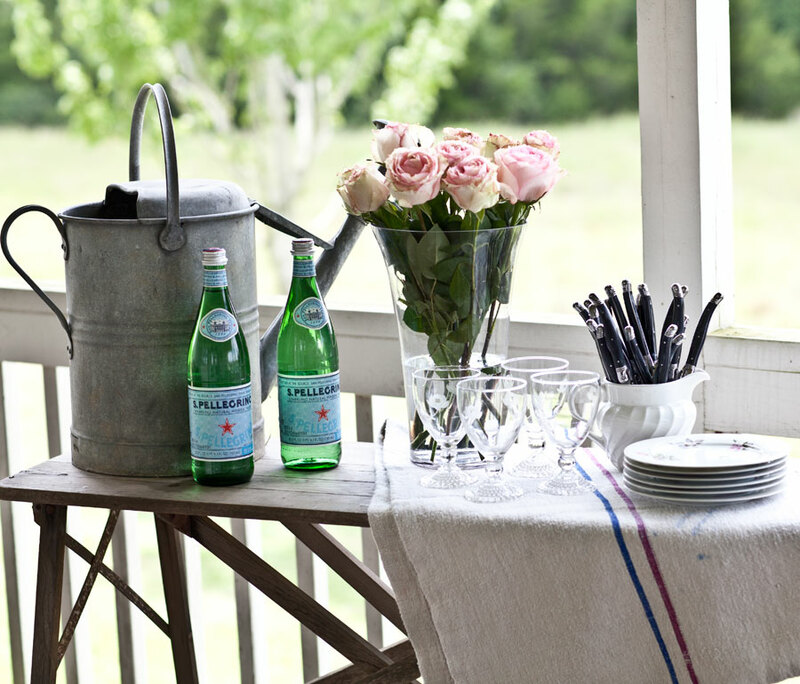 Yes, yes, yes to all your beautiful outdoor eating and French touches!! Thank you Anita..
How lucky you are to have such a lovely porch! I love dining outside. My family does not, but I persist for breakfast, snack time and sometimes for dinner, I went out to the back yard and realized I had really not given it a good look, so I am going to spend time this weekend cleaning it up a bit. Loved your ironing board idea and your dishes. Wow, stunning, simple but stylish, so many ideas I so want to try. Just looking at your back porch gives me such a sense of calm. How lovely it is.